I would like to ask you to prepare pictograms for system administration CentralNews. Purpose: To graphically illustrate user-defined settings for automatic newsletters - autoemails. C. To whom it can be sent. 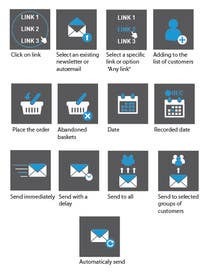  Action 1b: Select a specific link or option "Any link"
Action9: Send to selected groups of customers.